YEREVAN, Armenia, July 16, 2012 (ENS) – Armenia’s parliament has ignored objections from environmentalists and gone ahead with changes to the law that will double the amount of water drawn off from Lake Sevan, the largest freshwater resource in the Caucasus region. The change is a setback for a long-term project to raise the lake’s waters back to levels last seen in the 1950s, when industrial development started depleting the lake. Officials say it is essential to increase the annual volume of water taken from Lake Sevan from 170 to 320 million cubic meters a year to counter a drought in the agriculturally important Ararat Valley. Andranik Andreasyan, head of the State Committee for Water Management, said the drought had been severe, and reservoirs around the country were running low. The volume of water in the Aparan reservoir, for example, was now just a third of last year’s level. Yuri Javadyan, deputy head of a special presidential commission for Lake Sevan, said limited snowfalls over the winter means there is not enough meltwater feeding the rivers. Parliament passed the bill by 93 votes to 12, overruling objections from opposition members worried for the future of Lake Sevan. Environmentalists dispute the argument that Armenia is suffering from drought. 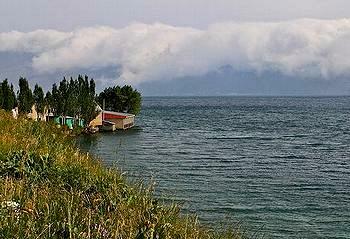 Lake Sevan fell by a meter a year from 1949, when schemes to channel off water started operating, and the pace increased after Armenia became independent in 1991. After 2002, however, the trend was reversed thanks to a World Bank-backed program, and water levels have risen by more than four meters since then. The plan is to achieve an annual rise of 20 centimeters until the ideal level is reached within 30 years. However, official estimates suggest the rising waters will flood roads running alongside the lake, and dozens of lakeside homes – many of them owned by senior members of Armenia’s political and business elite. That, say some environmentalists, is the real reason for draining off water – the drought is just a pretext to prevent rising waters inundating top officials’ holiday homes. “Since most of these properties belong to oligarchs and officials, the government is doing everything it can to stop them being flooded,” said Hakob Sanasaryan, chairman of the Union of Greens of Armenia. 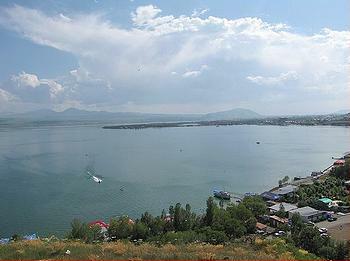 Environmentalist groups say that if the planned volume of water is drawn from Lake Sevan this year, the water level will fall by 11 centimeters, endangering fish species by interrupting their breeding cycle. Mher Mkrtumyan, head of the financial department at the government’s water management agency, denied that the decline would be a steep as suggested. “We’re only talking about two or three centimeters,” he said.